Towers and other vertical approaches are increasingly popular for aeroponics systems. Since the roots have need to spread out, this is a clever way to save space. A vertical setup also allows misting devices to by placed at the top, allowing gravity to distribute the moisture. A simplified diagram of an aeroponic system. By Lilkin / shutterstock.com. Aeroponic systems nourish plants with nothing more than nutrient-laden mist. The concept builds off that of hydroponic systems, in which the roots are held in a soilless growing medium, such as coco coir, over which nutrient-laden water is periodically pumped. 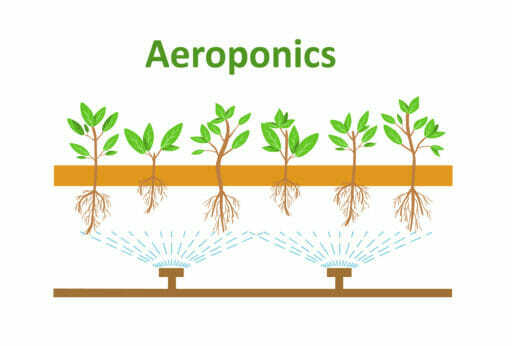 Aeroponics simply dispenses with the growing medium, leaving the roots to dangle in the air, where they are periodically puffed by specially-designed misting devices. In aeroponics systems, seeds are “planted” in pieces of foam stuffed into tiny pots, which are exposed to light on one end and nutrient mist on the other. The foam also holds the stem and root mass in place as the plants grow. Who knew naked roots could survive, much less thrive? It turns out that eliminating the growing medium is very freeing for a plants’ roots: the extra oxygen they are exposed to results in faster growth. Aeroponic systems are also extremely water-efficient. These closed-loop systems use 95 percent less irrigation than plants grown in soil. And since the nutrients are held in the water, they get recycled, too. In addition to these efficiencies, aeroponics’ eco-friendly reputation is bolstered by the ability to grow large quantities of food in small spaces. 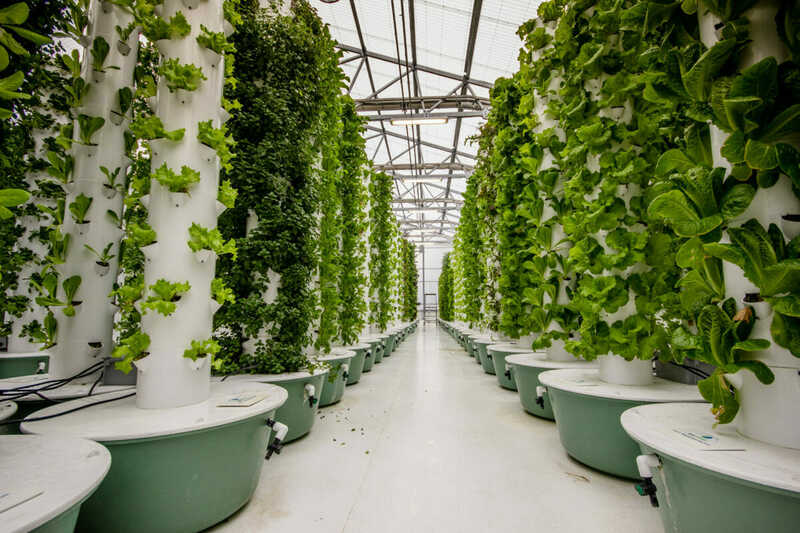 The approach is mainly employed in indoor vertical farms, which are increasingly common in cities – cutting down on the environmental costs of getting food from field to plate. And because aeroponics systems are fully enclosed, there is no nutrient runoff to foul nearby waterways. Rather than treating pest and disease with harsh chemicals, the growing equipment can simply be sterilized as needed. Aeroponics systems require a bit of finesse to operate effectively. The nutrient concentration of the water must be maintained within precise parameters and even a slight malfunction of your equipment can cause the loss of a crop. If the misters don’t spray every few minutes – maybe because the power goes out, for example – those dangling roots will quickly desiccate. And the misters need regular cleaning to keep them from becoming clogged by mineral deposits in the water. There is also one major drawback, environmentally-speaking: aeroponic systems rely on electrical power to pump water through the tiny misting devices. And while they can be employed in the natural light of a greenhouse, they are more often used with energy-intensive grow lights. Solar power or other alternative energy sources can be harnessed to eliminate this drawback, however. How Much Does an Aeroponics System Cost? DIY models can be made for less than $100, but good quality professional systems with automated nutrient monitoring and a backup power supply start in the four-figure range. All aeroponics systems require an enclosure to hold in the humidity and prevent light from reaching the roots (this is typically a plastic bin with holes drilled for each plant), plus a separate tank to hold the nutrient solution. Beyond these basic components, there are a few other things to consider in devising an aeroponic system to suit your needs. Some aeroponics systems are designed to be used horizontally, like a traditional planting bed. But towers and other vertical approaches are increasingly popular – since the roots need to spread out, this is a clever way to save space. Vertical systems are also popular because the misting devices may be placed at the top, allowing gravity to distribute the moisture. Another dichotomy in aeroponic equipment: high-pressure versus low-pressure systems. Low-pressure systems, which rely on a simple fountain pump to spray water through the misters, are inexpensive and suitable for DIY construction. This approach is sometimes called “soakaponics,” as low-pressure misters are capable of producing only a light spray, kind of like a tiny sprinkler, not true mist. For true mist – meaning moisture floats in the air and more effectively delivers nutrients to the roots – you need higher water pressure than an ordinary pump can provide. Thus, professional aeroponics systems rely on a pressurized water tank capable of holding 60 to 90 psi, along with top-quality misters capable of delivering the finest possible puff of moisture. Hydroponics suppliers increasingly stock a full-line of aeroponics equipment, from the nutrients, pots, pumps, timers, and tubing you need for a DIY system to fully-automated turnkey aero-farms. What Can You Grow with Aeroponics? Anything, in theory. In practice, aeroponics systems are primarily used for the same applications as hydroponics systems, including leafy greens, culinary herbs, marijuana, strawberries, tomatoes, and cucumbers. One exception is root crops, which are impractical in a hydroponic system, but well-suited to aeroponics, as the roots have plenty of room to grow and are easily accessible for harvesting. Other vegetable crops are possible but have more complex nutrient requirements. Fruiting shrubs and trees are impractical in aeroponics systems due to their size. I want to start my small farmhouse with aeroponics. Nice innovation..how can i start aeroponics? from the soil to the soil. Who manufactures the system illustrated in this article?